This is possibly my favorite picture, and is the same mare on the site heading. Thoroughbred mare, won a very tiny maiden claiming race, her registered name was Humming Breeze. Registered name Solar Satan. 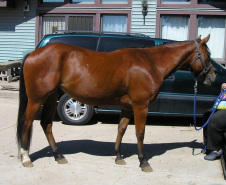 He was a Thoroughbred gelding who raced for 10 years, and then ended up with my friend, Fran. He was the lesson horse who ended up teaching me the true basics of balance and riding. He LOVED attention and got mad at me when I visited and didn't ride. 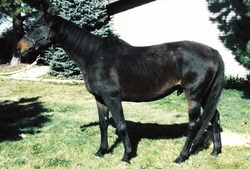 Pictured here at age 24, he was euthanized after an injury and colic the following year. I still miss him. Arab mare who loved apples like no other! 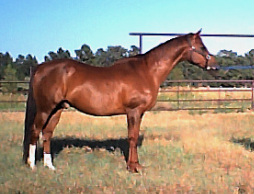 Was a successful show mare and produced several foals for her owner. I just loved on her. At the RMIHC horse show in 2008, wearing a beautiful hand tied mosquero. I traveled with his entourage to BreyerFest the year he was the celebration horse, although he was kept at home because of an outbreak of Vesicular Stomatitis. He never suffered from the condition, but the state of Colorado was quarantined and so he was unable to travel to Kentucky. Punkie is a Quarter Horse gelding, and is much loved by my friend Fran! She raised him from an orphan foal. National Show Horse gelding, was a youth show horse for his owner back in the day.